A group of Chetniks pose with German soldiers in an unidentified village in Serbia during World War II. Public domain photo by United States Holocaust Memorial Museum, via Wikipedia . Across Europe, extremist right-wing groups have employed historical revisionism to deny the Holocaust or make heroes out of World War II-era “quislings, ” or people who collaborated with Nazi forces, considered widely to be traitors to their countries. Instead of provoking the condemnation and ostracization of ruling elites who, to the outside world, present a more benign, pro-democratic face, this practice has sometimes benefited from their complacency, as two recent examples in Croatia and Serbia show. In Serbia, the latest scandal started with a Twitter post from a profile called Nacionalist.rs, an “informative portal of Serbian nationalists” with a bio stating “For Serbian State! For brotherly Russia! Against NATO, EU, IMF”. On May 7, 2018, it published a photo of some people identified as Serbian Army soldiers standing and saluting in front of the monument of Draža Mihajlović  (1893-1946) on Ravna Gora mountain. Delegation of the Army of Serbia yesterday paid their respects to general Mihajlović on Ravna Gora! Mihajlović was leader of the Chetniks , a group of Serbian nationalist guerrillas who espoused an ideology of Greater Serbia, and during World War II cooperated with the German Nazis, Italian Fascists and Croatian Ustaša  in their ultimately unsuccessful efforts to eradicate the Communist-led Yugoslav anti-fascist resistance. His cooperation with enemy occupying forces earned him the reputation of being a quisling. Once the war ended, Mihajlović was convicted and executed as a traitor and a war criminal. During the breakup of Yugoslavia in the 1990s, Slobodan Milošević's Serbian nationalist regime sponsored the revival of the Chetniks as a political factor. Some politicians, notably the convicted war criminal Vojislav Šešelj , identified with this ideology, and Chetnik apologia — including changing official history to present them as victims of “Communist terror” — became mainstream in Serbia. 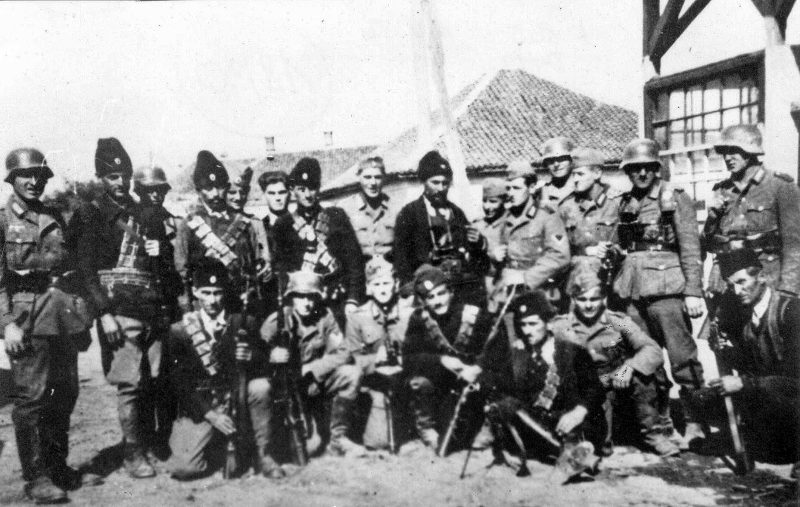 As a paramilitary force, these modern Chetniks were involved in a new wave of war crimes during the wars in Croatia, Bosnia and Herzegovina, and Kosovo. Some of them had also participated in other wars, like in Ukraine, on the Russian side . Official delegation of Serbian Army paid respects to general Mihajlović on Ravna Gora. This is final recognition of the anti-fascism and anti-nazism of the Ravna Gora army during Second World War. The incident further polarized the Serbian public, inciting fierce debate between two opposing sides: outraged liberals who considered it a betrayal of the values of anti-fascism, and nationalists who applauded the rehabilitation of the controversial historical figure. Meanwhile, the Serbian authorities offered feeble responses to journalistic inquiries about the event, which supposedly involved four buses worth of organized transport for about 200 soldiers . The Serbian Army's official website  doesn't contain any information about this celebration, which allegedly took place on May 6, St. Mark's Day, an occasion the Chetniks recognize as the start of their uprising in 1941. According to Blic Daily , the Serbian Ministry of Defense at first kept mum, then denied official participation of Serbian soldiers in the commemoration, implying they had been there as private citizens. Blic initially received unofficial confirmation that the photograph which appeared on social media is authentic, but that the soldiers took part in the ceremony “on their own initiative”. However, anonymous army sources told Blic  that the Ravna Gora event, which included the participation of all branches of the armed forces, was organized with the approval of Chief of Staff Ljubisha Diković , and with the knowledge of Minister of Defense Aleksandar Vulin. Blic also interviewed historian Miloslav Samardžić, who said that he was honored to take part in the event as keynote speaker at the invitation of the army, and that he had received a certificate of appreciation from the general staff. In the month following, the public received no further information about the investigation, which the Ministry of Defense claimed it had put into motion after the incident. Although Chief of Staff Diković subsequently made an unprecedented television announcement about his impending retirement , he didn't link this to the incident. The Serbian president and commander-in-chief of the armed forces, Aleksandar Vučić, who is otherwise omnipresent in the media and espouses opinions on various topics, failed to comment about the behavior of the soldiers under his command. Vučić was formerly a high official in Šešelj's Serbian Radical Party, and the Minister of Information in the Milošević government. In 2008, he co-founded the Serbian Progressive Party (SNS), which branded itself as pro-European Union, and later became a member of the center-right European People's Party  (EPP). Since 2012, SNS had been the central element of governing coalitions. Jewish community leaders reported evidence of Holocaust denial and publicly expressed dissatisfaction with the government’s response to a veterans group’s placement of a plaque bearing the World War II-era Ustasha salute ‘Za Dom Spremni’ (For the Homeland, Ready) near the World War II-era Jasenovac death camp  in 2016. President Grabar-Kitarovic and Prime Minister Plenkovic both condemned the placement of the plaque in Jasenovac. In September, the government relocated the plaque from Jasenovac to a veterans’ cemetery in the nearby town of Novska but did not make a legal determination on the use of the controversial Ustasha-era salute. While refraining from openly endorsing the WWII-era fascist movement Ustasha , the ruling Croatian Democratic Union (HDZ)  had been involved in giving history a positive spin and rehabilitating the legacy of some of its members. HDZ nominally declares itself as center-right party and is also an EPP member. One major instance of this trend is the commemoration of quislings who had been summarily executed by the anti-fascist resistance  in Bleiburg, Austria, in May 1945. They were captured while trying to flee Yugoslavia after the capitulation of Nazi Germany. For years, HDZ members had been organizing “pilgrimages” to Bleiburg , mimicking the iconography of the Passion of Jesus Christ . Under HDZ rule, the Croatian parliament had been organizing official commemorations at Bleiburg on May 12, with rhetoric presenting the events as a “symbol of suffering of the Croatian people”. The events even included a Catholic mass. Whitewashing a very complex history, HDZ official announcements  condemned “the crimes of Communist villains”, but ignored the connection of the executed quislings with the mentioned “fascist crimes during World War II”. Commemoration at Bleiburg – marked the 73rd anniversary of the suffering of the Croatian people. Nazi or fascist salutes with a raised right hand, often tolerated in Croatia (as noted by the US State Department's human rights report quoted above), is a criminal act in Austria. This year in Bleiburg, Austrian police arrested six HDZ members who used the salute  or other forms of fascist symbolism. One of those arrested was Anđelko Bosančić , a prominent HDZ member from Dugo Polje, who had traveled to Bleiburg at the expense of Croatian taxpayers  “as [a] representative of his municipality,” according to the Croatian press, which also labeled him as Ushtasha . HDZ and anti-fascism. How many municipalities pay for traveling to the biggest Nazi party in Europe? Is there any newspaper who would research this issue? The song in question is “Od stoljeća sedmog”  (“Since the seventh century”), which promotes Croatian endurance in spite of their enemies’ bloody attempts to destroy them. All six Croatian citizens arrested at Bleiburg are still in Austrian detention , though some of their trials are scheduled to take place between June 19 and 29, 2018. Bosančić is facing up to 10 years in prison, as Austrian authorities claim zero tolerance for neo-Nazi and extremist incidents. His lawyer said he will try to prevent his case from reaching federal court, which would treat his crime at the same level as murder or armed robbery. This stern treatment is “a consequence of the negative experiences Austria had with the time of Hitler and his heritage”, the lawyer explained in a statement  to the Croatian daily, Slobodna Dalmacija. The rehabilitation of the legacy of Nazi collaborators in Serbia and Croatia is part of a regional trend related to the rise of the extreme right in Europe. It is tied to the surge of right-wing populist parties and antisemitism across the continent (in particular in Central and Eastern Europe), ranging from state policies in Hungary , to tolerance of neo-Nazi manifestations in Bulgaria , and incidents in Macedonia . State capture  — the situation of subversion of the state institution to ruling political parties — by such forces enables impunity for hate speech and hate crimes. The historical revisionism based on the ideological preferences of ruling parties represents a direct challenge to the culture of remembrance of past human rights abuses as a precondition for the prevention of future crimes against humanity.